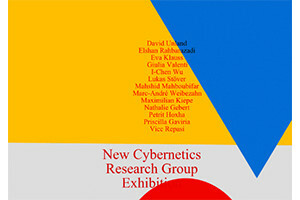 Cybernetics is a transdisciplinary approach for exploring regulatory systems, their structures, constraints, and possibilities. Cybernetics was established in the 1940s as a practical and theoretical framework, mainly driven by the development of war machinery. After its big hype in the 1960s it dissolved into different disciplines like computer science, sociology, anthropology, psychology, philosophy and architecture. While the core of cybernetic ideas, especially the regulating qualities of negative feedback, became a tool of control and enforcement; A smaller, not so well known leg of cybernetics, so called “New Cybernetics” (Gordon Pask) or “Second-Order Cybernetics” (Margaret Mead and Heinz von Förster) introduced cybernetics of cybernetics, looking at cybernetics from within and with cybernetics. Margaret Mead defines “cybernetics as a way of looking at things and as a language for expressing what one sees”. 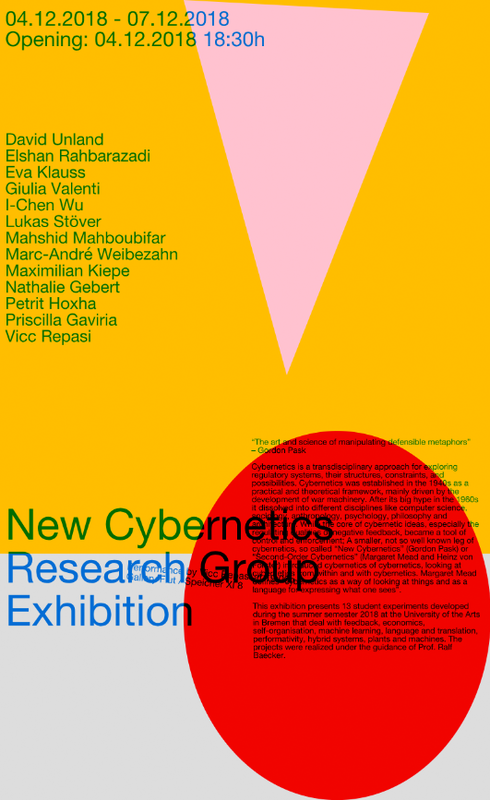 This exhibition presents 13 student experiments developed during the summer semester 2018 at the University of the Arts in Bremen that deal with feedback, economics, self-organisation, machine learning, language and translation, performativity, hybrid systems, plants and machines. The projects were realized under the guidance of Prof. Ralf Baecker.